In November of 2004, I got a call from my father’s doctor at 8 a.m. to get to the hospital in Brampton, Ontario as soon as possible. My father had turned very ill. Driving myself was out of the question; it would be too slow. The quickest train would get me there at about 5 p.m., so I decided I had to fly. Now, I’m not thrilled about flying. I booked a 10 a.m. flight to Toronto with Westjet Airlines, which I had never used before, but they told me I had to be at the Ottawa airport by 9 a.m.
We got caught in awful traffic on the highway and before I knew it, it was 9:15. I called from my cell phone and they told me if I wasn’t there by 9:30, I would miss the 10 a.m. flight. The next flight to Brampton was three hours later, at 1 p.m.
Driving further we got caught in construction, and in the meantime, I got another call from my Dad’s doctor, saying I had better get there as quickly as possible. By this time I was a wreck — it was now 9:30 — and called back to Westjet, told them my story and they said they would see what they could do. I finally arrived at Ottawa airport. As I hurried toward the counter, a Westjet rep asked if I was Pat, and told me not to worry, they had delayed the plane. Then they gave me a discount for the flight! They rushed me through security, and put me on the plane before anyone else with a flight attendant to sit with me. When I arrived in Toronto I walked off the plane worrying about how I could get to Brampton the quickest. Immediately, another person from Westjet met me with my luggage and asked which hospital I was going to. They took me to the bus stop, had someone get on with me and made sure I got to the right hospital within 30 minutes from getting off the plane. I arrived in my Dad’s room and lost him 15 minutes later. 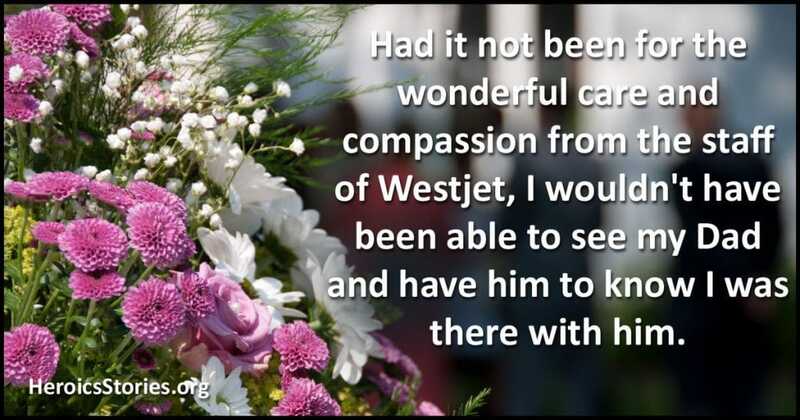 Had it not been for the wonderful care and compassion from the staff of Westjet, I wouldn’t have been able to see my Dad and have him to know I was there with him. All too often we hear the complaints people have about corporate behaviour, but we seldom hear about the good things people do. I want to convey my deepest thanks for Westjet’s nearly unbelievable service. I just broke into tears after reading this. My father had a similar experience, but with a different airline, Air New Zealand. My parents live in New Zealand but have children in Israel and England. About 5 years ago when my father was visiting my sister in London as he was landing, he got a message that my mother had suddenly been hospitalized. He immediately contacted the airline who arranged to rebook his trip back to new Zealand on the next flight (which was later that day). My father was clearly anxious about my mother’s health, and worried about the long flight with 2 connections. When he arrived at the check-in counter as soon as he gave his name to the representative at the Air New Zealand check in counter, she immediately assured him that they would do everything in their power to get him back to New Zealand as soon as possible to see his wife. And Air new Zealand were good to their word, at every stage of the journey, they ground and flight crews made a point or reassuring my father that they were getting home to his sick wife as quickly as possible. That reassurance and simple good word put my father at ease and made the entire ordeal much easier for him to handle. Stories like this are almost unbelievable! It is heart=warming to know they still occur.